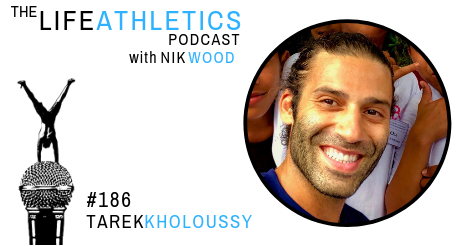 Life Athletes, hello and welcome to episode 186 of the Life Athletics podcast. Today’s guest life athlete is Tarek Kholoussy. Like most All-American children, Tarek was born and raised in a small town (in Philadelphia), went to college, and dove into the corporate world. It was an ideal life with clear expectations of him, but it wasn't the life he felt he was destined for. So he set off to find himself and get to know who he really is deep inside - a thousand days before he turned forty. So he packed up and left his high-level job and set out to travel the world and find his purpose. Today, Tarek is a social entrepreneur and founder behind "Nomads Giving Back," which aims to create an infrastructure to inspire and enable digital nomads to give back to their adopted homes. It's safe to say that Tarek has definitely transformed himself and is now living his best life, while helping marginalized communities throughout the world. Talk about a purposeful life! Listen in to the conversation to learn more about Tarek and his social enterprise.